(Nanowerk News) Access to high quality institutions could make curbing global warming substantially easier. That's the conclusion of scientists at Pacific Northwest National Laboratory, the University of California San Diego, Resources for the Future and the University of Maryland in a new study published in Nature Climate Change ("Improved representation of investment decisions in assessments of CO2 mitigation"). 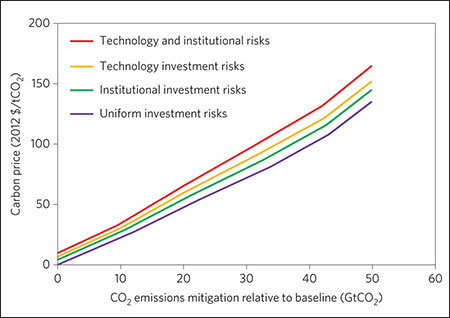 They found that two institutional factors—variations in world-wide investment risk and technologies—may shift efforts to reduce emissions from developing countries to developed countries. The research also found these factors substantially change the cost of cutting global carbon dioxide emissions in half by 2050. 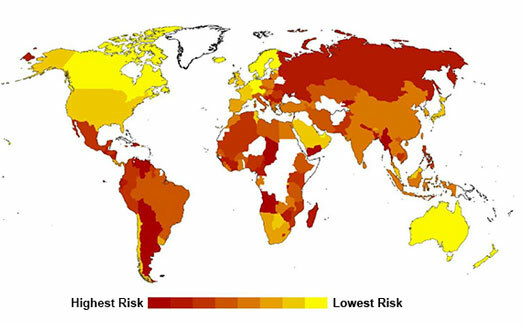 World Map Investment Risk. In the business world, investors require risk-adjusted rates of return. Based on the World Economic Forum’s Global Competitiveness Index dataset, this map represents the areas of the world with low-risk to high-risk energy investments due to differences in institutional quality. The cost to build and support new energy-producing technologies is expected to be greater in areas of high versus low risk. The new study takes these factors into account to gauge the cost of mitigating future climate warming. "For example, investment banks would charge higher interest on a loan to a firm that builds a wind farm in India, compared to, say, the U.S., because banks treat the Indian investment as financially more risky," said Gokul Iyer, lead author and researcher, working at the Joint Global Change Research Institute (JGCRI), a partnership between PNNL and the University of Maryland. Location, location, location. When investment decisions are being made, this real estate mantra applies. Institutional qualities, such as the infrastructures to support development and industry, are important factors for considering investment decisions. This study found that when they accounted for international differences in institutional qualities for technology investments, the costs of reducing carbon dioxide emissions are substantially higher and the increases are primarily borne by industrialized countries. "Our study looks at how the variation in investment risks impacts which technologies are actually used to reduce emissions and where those emission reductions occur," said Iyer. Methods: To understand the implications of real-world data, researchers used the Global Change Assessment Model (GCAM), a technologically detailed climate-energy-economy integrated assessment model developed at JGCRI. Taking into account the large variation in investment risks in real-world technology decisions, they used GCAM to analyze conditions that affect where and how energy investors undertake investments. Marginal abatement cost curves to achieve a 50% global emissions target under different investment risk scenarios by year 2050. Computing the impacts on the costs and geographical distribution, the research found that accounting for such variations increases the cost estimates of reducing by half global carbon dioxide emissions in 2050 by up to 40 percent. Further, the research concludes that major efforts to bring about institutional reforms will be a critical element of a larger global effort to address climate change. Absent reforms, the effort to mitigate global warming would be ineffective in developing countries, and hence, the majority of mitigation effort would shift to developed countries. The study looked at one variable-quality of national institutions-among many that affect investment decisions. Although an important factor in the cost of limiting global warming to 2°C, other factors might have different or even counteracting effects. Future model research should use real-world assumptions to understand the implications of other factors and their interactions with each other.